Delight dinner guests at your next event with our stunning set of plates and cutlery. This combo pack includes 8" and 10.75" plate, fork, spoon and knife. Made of premium plastic, each plate combines the convenience of a disposable with the stunning appearance of real china. 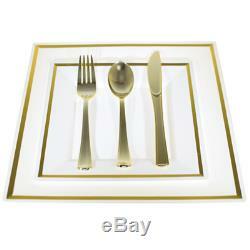 Each plate features an elegant, metallic silver or gold accent line that is certain to enhance any table setting. Matching the plates perfectly are our premium line of silver or gold cutlery. Choose the number of guests attending and color of plates/cutlery with the drop-down menu. Perfect for weddings, engagement parties and other elegant events. 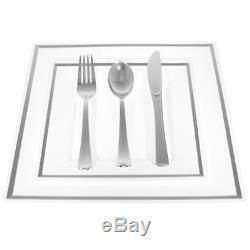 Includes: 8" square plate 10.75" square plate Plastic fork Plastic knife Plastic spoon. For example, if you place an order for 80 guests, you will receive. The item "Bulk, Dinner/Wedding Disposable Plastic Square Plates silverware, silver/gold rim" is in sale since Wednesday, August 9, 2017. This item is in the category "Home & Garden\Kitchen, Dining & Bar\Dinnerware & Serving Dishes\Other Dinnerware". The seller is "factorydirectparty" and is located in Pittston, Pennsylvania. This item can be shipped to United States, Canada, United Kingdom, Denmark, Romania, Slovakia, Bulgaria, Czech republic, Finland, Hungary, Latvia, Lithuania, Malta, Estonia, Australia, Greece, Portugal, Cyprus, Slovenia, Japan, China, Sweden, South Korea, Indonesia, Taiwan, South africa, Thailand, Belgium, France, Hong Kong, Ireland, Netherlands, Poland, Spain, Italy, Germany, Austria, Israel, Mexico, New Zealand, Philippines, Singapore, Switzerland, Norway, Saudi arabia, Ukraine, United arab emirates, Qatar, Kuwait, Bahrain, Croatia, Malaysia, Brazil, Chile, Colombia, Costa rica, Dominican republic, Panama, Trinidad and tobago, Guatemala, El salvador, Honduras, Jamaica, Antigua and barbuda, Aruba, Belize, Dominica, Grenada, Saint kitts and nevis, Saint lucia, Montserrat, Turks and caicos islands, Barbados, Bangladesh, Bermuda, Brunei darussalam, Bolivia, Ecuador, Egypt, French guiana, Guernsey, Gibraltar, Guadeloupe, Iceland, Jersey, Jordan, Cambodia, Cayman islands, Liechtenstein, Sri lanka, Luxembourg, Monaco, Macao, Martinique, Maldives, Nicaragua, Oman, Peru, Pakistan, Paraguay, Reunion.